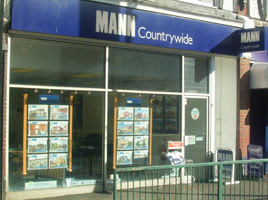 Mann Countrywide estate agents in Worcester Park has disappeared quietly into the cold October air - yet another victim of the dramatic end to the property dream. They join Andrews, Samuel James, Knightwood Estates and Grand Estates in the growing list of Worcester Park estate agents who have bitten the dust in recent months. I suppose these things are cyclical and when the next property boom comes around they will rise phoenix-like from the ashes and the streets of KT4 will once again be choked with estate agents driving around in their irritating company-liveried Mini Coopers. In the meantime, there's yet another empty shop unit in Worcester Park. Welcome to Halloween. And welcome to our ghost town.